I thought I would share a few of my recent finds. I have been looking for a nice old French basket lately. I saw this one and instantly liked it. What do you think of this olive basket? I wish I had a small lemon tree or myrtle topiary to place in it. The piece de resistance, though, is the pernod sign I found. The memory of drinking pastis at a cafe in France is one of my happiest. Tough as it is, I have listed these new treasures in my Etsy store. pretty pretty. i have an oyster basket as well, there are so many uses for them. mine currently holds a houseplant in our front hall. Oh wow Michele, fantastic pieces!!! Hope your doing well and have a lovely Sunday!! Love your new finds! I have one of those olive buckets myself and use it in my kitchen holding flowers. You can never have too many containers, right? Love the basket...you should keep it!!!! S.O.S! Help me, i am left breathless with your finds. I so wish I had found this many great pieces in any length of time, to find a cool piece it's a shock and I value that find until the next great find. As for your oyster basket of bleu where did you find this beauty and I hope it was not that cheap because a few years back I bought one at Anthropologie and it was in the $80.00 price range mine was a rusty tone with white and built up with a lot of crusty texture, I so wish mine were bleu a perfect French patina as you havé to add to your home. Did you see Fifi's new French Country style magazine? It's oh so French and inspiring to our French finds. Love all your finds, I am so inspired to keep my eyes open to find pieces of desire as you have. I have a French post this week in whites and grey's. Ooooo, they are all wonderful! 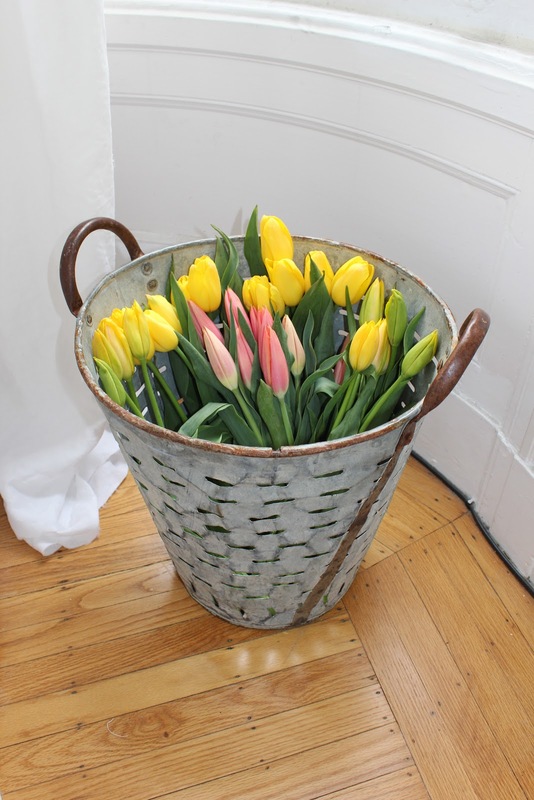 I love baskets and buckets, and these look so amazing with the flowers in them.